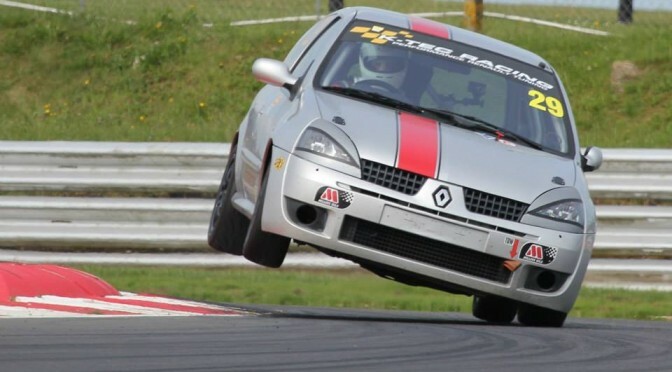 The K-Tec Racing Clio 182 Series once again provided a couple of thrilling races with ex-Stock Hatch racers to the fore. In the first race Jeff Humphries took a convincing lead from his pole position. Local man Martin Ward, who had a disastrous weekend at Silverstone, was able to hold off Matt Fincham despite several challenges throughout the course of the race. Ben Seybold moved ahead of Patrick Fletcher in the opening stages of the race for fourth position and was always in touching distance of the podium positions but was never able to make it into the top three. Fletcher also fell behind Mark Hammersley on the seventh lap of the race and therefore only managed to finish in sixth position.